Thunder In The Night: Video game warriors escaping game grid. This is an illegal exit. Video game warriors escaping game grid. This is an illegal exit. 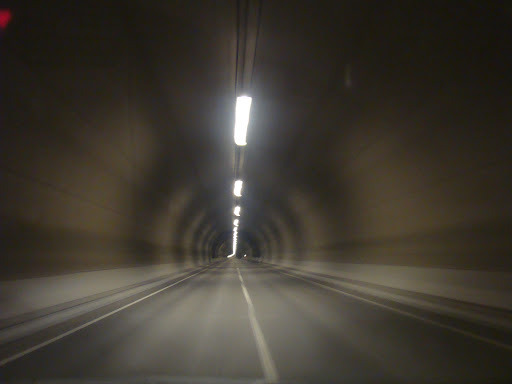 Like something out of Tron we zipped through countless tunnels and some of the most unbelievable roads I have ever driven. Smooth, curvy, quiet and endless. We pinned apex after apex, rising and falling over mountain passes on our way out of Bergen, north, towards the Norwegian Alps. At times it felt so unreal that I thought we were watching someone with a misspent youth play Gran Tourismo on one of the endurance races. We stopped only for a couple of ferries across two dark fjords as night crept over the land from the east. Coffee and excitement fuelled our adventure tonight. We arrived too early for the last ferry we needed so wired on caffeine we took the narrow, pitch black road around the fjord. With full beams blazing we startled a hjort which was loitering on the road before it scattered up a steep rock face. We were told that we were driving into some of the most beautiful mountains in Norway but we would have to wait to see them, try and get some sleep and then tomorrow we would awake at the foot of some spectacular nature. After seven hours we pulled quietly into the dark campsite, tyres popping on the gravel, pulled up outside a small hytte and were ushered inside by our guide Rolf who had prepared some seriously hearty soup. Lumps of meat and potatoes that would worry a dreadnought. It's called stew where I come from. We slid into fitful sleep.